Section after trip in front of the office on Devil's Island. 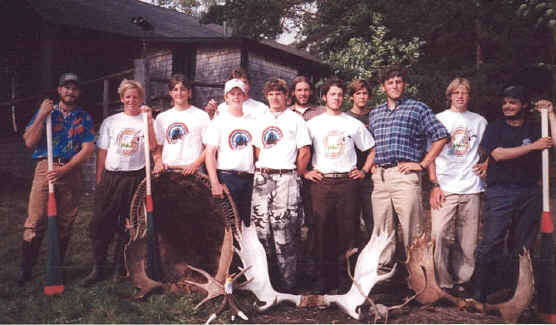 Left to right: Bart Pinkham (guide), Todd Hunsdorfer, Garrett Kephart, Chris Kerhes, Seton Marshall (hidden), Marc Lechner, Worth Elison, Bob Neill, Andrew Hunt, Alexander "Brooks" Yellen, John Pearson, Bill Seeley (staff). The Cree paddles were gifts from Matthew Wapachee, their guest between Nemiscau and Waskaganish. Traded items from Waskaganish, front row, left to right: beaver pelt on a stretcher, moose antler (base of stretcher), bald eagle carved from moose antlers, moose antler, caribou antler, moose antler. The original trip planned for the Great Whale River was diverted by fire to the Rupert River. Special thanks to Cree elder Matthew Wapachee (pronounced Wah-PA-chee) of Nemiscau who accompanied us down to Waskaganish from Nemiscau. "When my father was old and too sick to travel in the bush, he would tell us stories about his times running the brigades, and travelling to and from Waskaganish with his friends. Those were his glory days. So now I go up and down every chance I get. I never did before he died. This is how I remember."